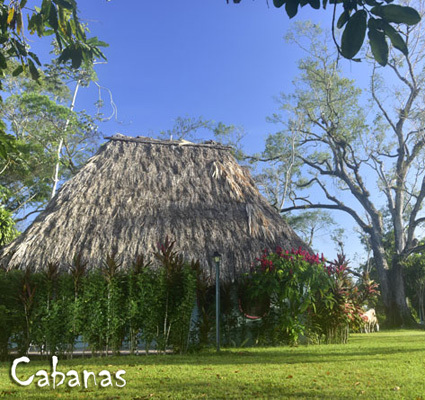 Situated on the mighty Belize River and central to all of Belize, the ranch is a place where the horses roam free and huge iguanas laze in the branches above the bamboo. The land here is surrounded by evidence of both the ancient Maya and a historic logging tradition. 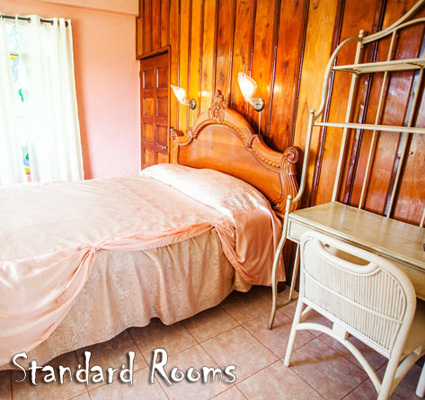 Nestled in a quiet jungle setting, in the midst of birds and other tropical wildlife, the jungle ranch resort features delightful accommodations that blend with the local landscape and culture. Home to the finest equestrian center in Belize, here you will experience something different from the familiar. If you've ridden over mountains, prairies and park lands we know your expectations are high. Can the tropics show you anything you haven't already seen? Absolutely! You awaken to the shimmering glow of dawn materializing through the tropical haze. Horses are roaming freely and grazing in green pastures surrounded by large palms. The day is young and a sudden rush of excitement fills the air. It's time to ride! The ranch is big, beautiful and boisterous. Miles of jungle and riverside trails are awaiting you. There are opportunities to experience horsemanship in a variety of ways, from setting your own trail itinerary to participating in structured instructor lessons. The well kept horses, quiet river, gentle breeze, flocks of parrots, saturated sunsets, delicious meals, friendly people, and exotic surroundings will sooth your soul. In addition to the day to day riding tours, you have the opportunity to participate in a hands on experience with the horses here. In the arena or on the trail, communication between horse and rider begins to meld. The concepts we follow are those of natural horsemanship, as presented by John Lyons and Pat Parelli, two of the most popular horse clinicians in the United States, and are the basis for horsemanship at the ranch - even down south here in Belize! Key words are communication, trust and discipline. Of course you may just opt for just some exciting trail riding instead. While we mostly ride western, we also have two sets of English saddles and tack for your use. There are miles of jungle trails in and out of the forest canopy. Nice long canters along jungle trails can be an exhilarating experience. This is a place far from the real world and near to the things you've dreamed of. An exciting, yet peaceful place. You will be taking more than pictures home. You'll have memories to last a lifetime! Available every week from Saturday to Saturday. You'll be met at the Airport for your transfer to our lodge. If you arrive on an early flight you might want to visit the Belize Zoo or Old Belize. After check-in, you can tour the grounds and get acquainted with our own local wildlife. Soon dinner will be served family style, providing perfect time and setting to meet your hosts and the other guests. After breakfast you select and get to know your horse. We'll start our with some pointers in the round pen and arena and after lunch we'll take you to a challenging ride to Tiger Creek. Then we'll wind down at dusk with a relaxing stop at the Birding Tower by the lagoon. Take your binoculars to see some of the 210 species of birds identified. By now you've probably bonded with your horse and have honed your skills and horsemanship. Our wrangler will provide tips and pointers as you ride. Your afternoon trail experience will take you through more jungle along the river and through teak trees and fields of corn or beans. If you like we'll stop for a river swim before heading back for an evening of relaxation, chats about the day and another great meal. With the new skills you've learned, you may want to try out a more challenging horse, but if you want to stick with your buddy, that's okay too. Today we'll do the Maya Trail and Colorado Lagoon stopping for a picnic lunch on the way. This trail will test your endurance a bit but it's worth it for the true jungle experience. The staff is preparing you a hearty meal back at the lodge and a good night's sleep will refresh you for the day ahead. Today we're off to Roaring River Cave. We'll ride through the village of Roaring Creek and explore a seldom visited cave where you'll see ancient artifacts and feel an exquisite Mayan presence. We'll break for lunch at wonderful swimming hole so be sure to take your swimming suit. The water's quite clear and you might want to bring along a snorkel mask too. Chill back at the ranch with dinner and conversation. For a change in pace, we'll take you down the Belize River in the skiff where you'll be guided through Guanacaste Park. The park is famous for it's 10 foot diameter tree and multitude of birds. Iguanas dart along the paths and scamper up the trees while you observe hundreds of botanic wonders. After lunch back at the dinning room, and an afternoon of relaxing we'll saddle up for a sunset ride. This is going to be fun! This morning you'll test your skills and speed on the obstacle course, and we'll have a little barrel race competition. You will be awarded with a certificate of achievement, and an opportunity to win a prize. Lunch will be either at the ranch or in town depending on time and weather. The afternoon will be spent driving down the Western Highway to historic town of San Ignacio. We'll stop at the Butterfly Farm and Belize's most visited and best restored Maya ruin, Xunantunich which is Mayan for 'Maiden of the Rocks'. In case you didn't get enough riding in, you may choose to do a short aloha ride (we hate to say goodbye). If there's time you can stop for a tour on the way back to the airport or wherever you wish to go within our transfer range. There is an option to visit Mayan Temples of Tikal (Guatemala) during the week or we can add a day for you. There is an extra charge and we will need a minimum of 3 participants. Tikal is one of the largest archaeological sites and urban centers of the pre-Columbian Maya civilization. It is located in the archaeological region of the Petén Basin in what is now northern Guatemala. Tikal was the capital of a conquest state that became one of the most powerful kingdoms of the ancient Maya. Though monumental architecture at the site dates back as far as the 4th century BC, Tikal reached its apogee during the Classic Period, ca. 200 to 900 AD. During this time, the city dominated much of the Maya region politically, economically, and militarily, while interacting with areas throughout Mesoamerica such as the great metropolis of Teotihuacan in the distant Valley of Mexico. Tikal is the best understood of any of the large lowland Maya cities, with a long dynastic ruler list, the discovery of the tombs of many of the rulers on this list and the investigation of their monuments, temples and palaces. An early breakfast prepares you for a 'must see' trip to visit the Temples at Tikal in Guatemala. Your English speaking guide will lead you through the 5 major temples built around 700 AD - he dominant features of the city, identified only by numbers. Two of them stand in the middle of the square which can be viewed only from the top of the temple number 2. The top of this temple reaches the height of 38 m. Temple number 1 is not accessible, for safety reasons. The north acropolis stands among these temples. Archaeologists uncovered layers of earth, and thus proved that the Maya had lived here before Christ. The current appearance of the acropolis comes from the 8th century AD. Nowadays, Tikal has become a part of the Tikal National Park , and in 1979 it has been proclaimed a UNESCO World Heritage Site. The tour lasts 4-5 hours. Pace: Moderate with lots of opportunities for canters and gallops - according to riding level.